The Sportline isn’t necessarily a performance model, but it does have performance-minded parts designed to deliver a more lively driving experience. 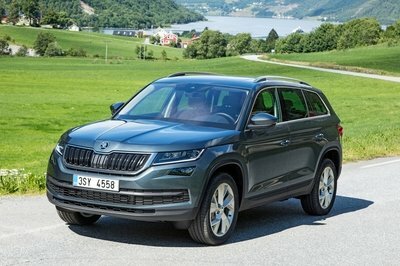 Skoda is rumored to be developing that performance model, though, and reports suggest it will be called the Kodiaq vRS. But back tot eh Sportline. The Kodiaq Sportline is visually different thanks to blacked out trim including the grille, side mirrors, roof pillars, and roof rails. The headlights are smoked, too, matching the tinted windows up top. The rear bumper also gets a racier look and the wheel choices include 19-inch “Triglav” alloys as standard and optional 20-inch “Vega” Anthracite alloys. Inside, the Sportline gets black Alcantara covering sport-minded seats with silver contrast stitching. Stainless steel pedal covers are added, too. The driver information screen in the gauge cluster gets readouts for oil pressure, coolant temperature, and boost pressure, not to mention that lap timer and G-meter. Ambient LED lighting helps add an air of luxury during night drives. 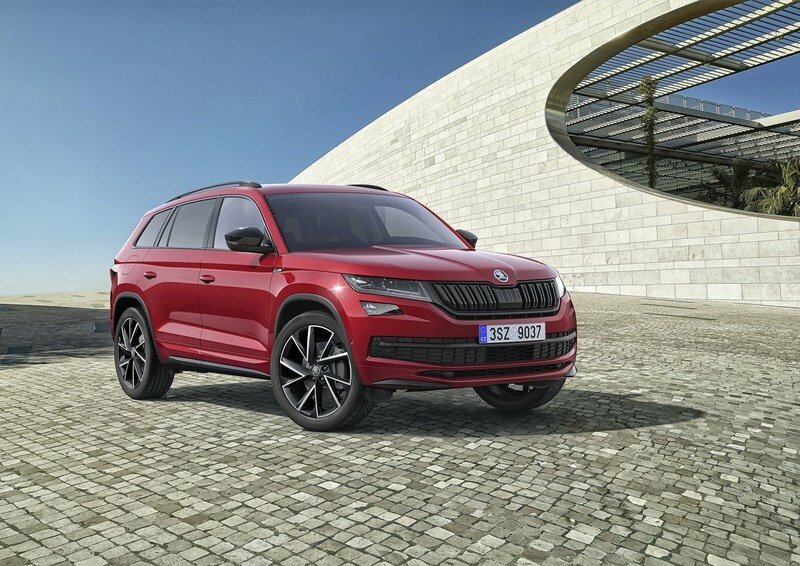 Under the skin, the Kodiaq Sportline gets optional adaptive dampers with the Adaptive Dynamic Chassis Control and is paired with Skoda’s Driving Select Mode system. 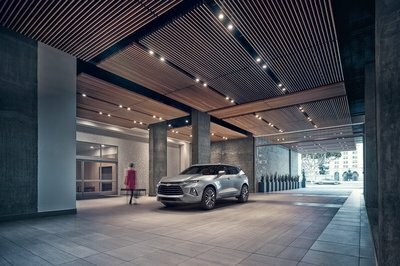 All four of the Kodiaq’s engine options are available. 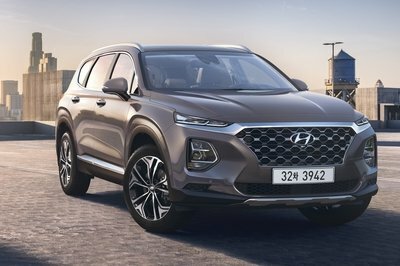 These include two gasoline engines, being a 1.4-liter gasoline mill with 150 horsepower and 184 pound-feet of torque and a 2.0-liter TSI with 180 horsepower and 236 pound-feet of torque. 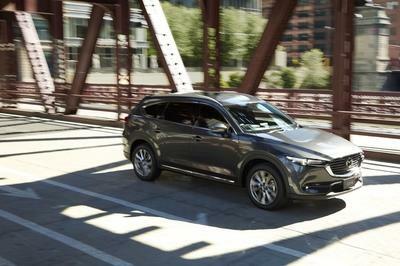 A 2.0-liter turbodiesel four-cylinder is available in two outputs: the first with 150 horsepower and 251 pound-feet of torque and the second with 190 horsepower and 295 pound-feet of torque. At the spectrum’s opposite end from the Kodiaq Sportline is the Kodiaq Scout. Skoda fitted this model to be more rugged and apt to actually travel off the beaten path. As such, its suspension is slightly raised for a higher ride height and better ground clearance. Smaller, 19-inch wheels have tires with taller sidewalls than either wheel and tire combination available on the Sportline. Underneath, the Kodiaq Scout has extra skid plates that help protect vital components from trail damage. Visually, the Scout gets a slew of satin chrome trim, including the lip along the front and rear bumpers, the side mirror caps, and the roof rails. Those wheels also have machined faces, matching the rest of the trim work. Powertrain wise, the Kodiaq Scout comes with the same engine options as the Sportline, all backed with either a six-speed manual transmission or a DSG automatic. Naturally, the Scout comes standard with AWD. It also has a barrage of off-road electronics designed to help the driver navigate tough terrain. The adaptive dampers are controlled by the Off-Road Assist system, as is the throttle response, traction control, and ABS system when in the various modes. Downhill Descent Control and Hill Hold are also present. Both the Sportline and Scout come with many of the same features and equipment. 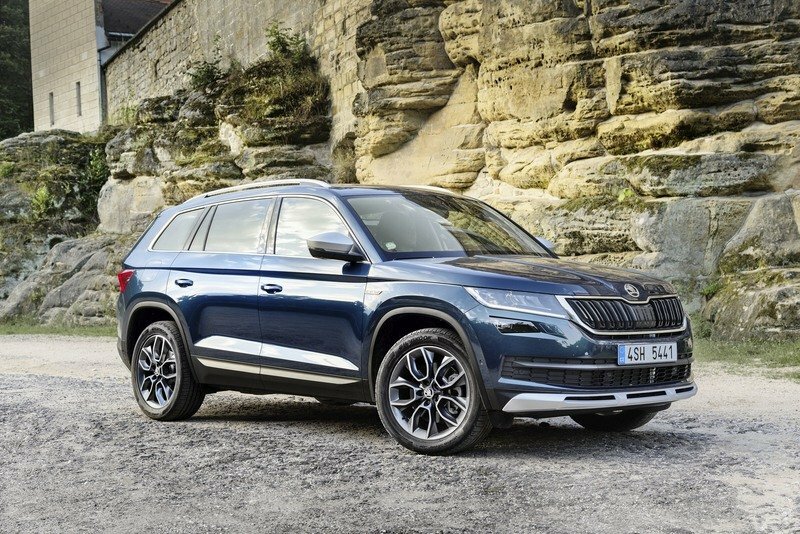 These include the 9.2-inch infotainment system with Skoda’s Columbus system and satellite navigation, a Wi-Fi hotspot, and a 360-degree camera system with an overhead view. The driver information screen in the gauge cluster is controlled by the multi-function steering wheel controls, and both have LED ambient lighting. Safety systems include Trailer Assist, Blind Spot Detect, Rear Traffic Alert, and Front Assist proximity sensors. That 360-degree camera system is also a worthy mention here, too. 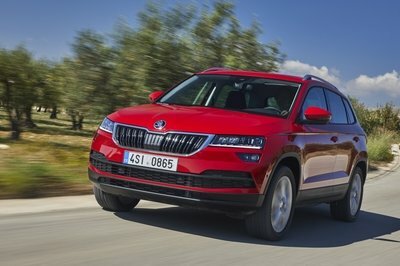 Read our full review on the Skoda Kodiaq. 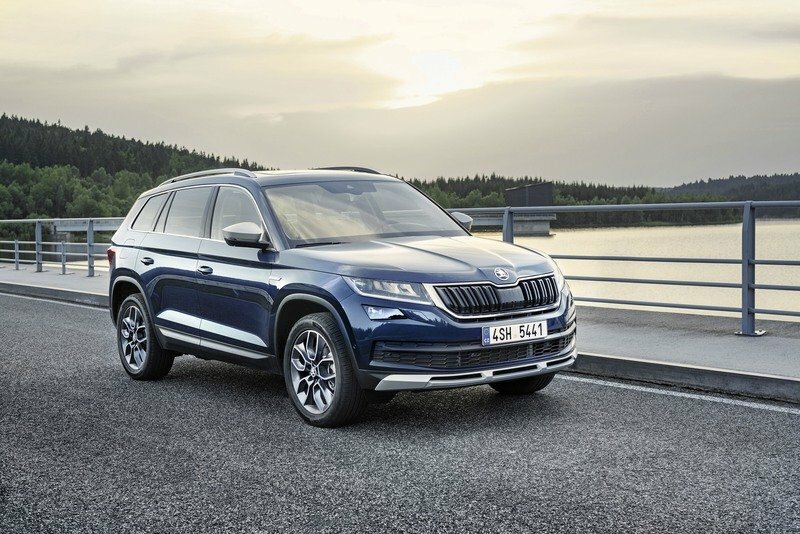 With the ŠKODA KODIAQ SPORTLINE, the Czech car manufacturer presents a particularly dynamic version of its new large SUV. The series-standard anthracite-coloured 19-inch ‘Triglav’ alloy wheels and the optional 20-inch ‘Vega’ Anthracite alloys characterise the exterior of the dynamic model version. Sporty highlights also include the black grille, black exterior mirrors (electrically adjustable, heated, foldable), door protection strips finished in the car colour, and an individually designed rear bumper. The rear windows are tinted (SunSet), a black roof rack is available as an option. Also in the black interior, there are many new details and features – such as sports seats with Alcantara® upholstery and silver-coloured seams. The stainless steel and aluminium pedals also underline the sporty, dynamic character of the vehicle. In the DSG versions, the multifunction leather steering wheel also has shift paddles. SPORTLINE logos are located on the front mudguards and glove compartment. The central infotainment display of the ŠKODA KODIAQ SPORTLINE shows the oil and coolant temperatures, acceleration, and boost pressure. The lap timer can also be used to measure the time of each lap. The ŠKODA KODIAQ SCOUT also stands out visually and technically from the basic model. It is equipped with all-wheel drive. 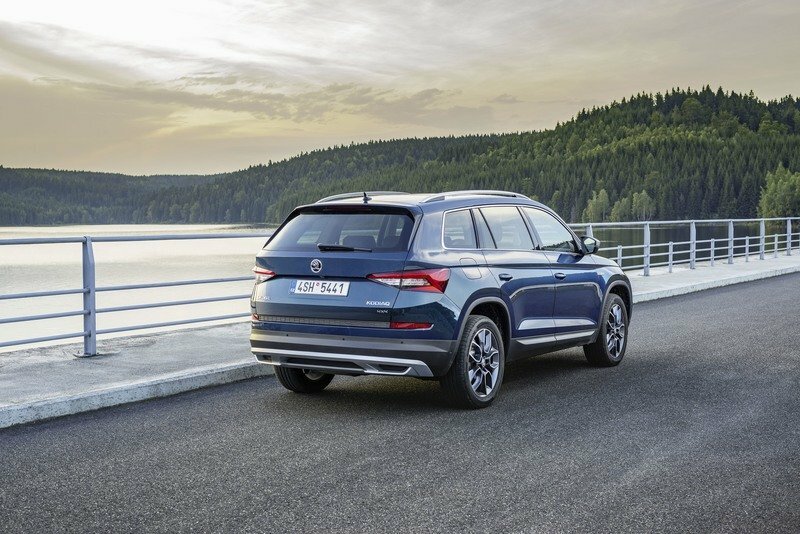 Details such as the roof rack, exterior mirror casing and the special underbody protection (front and rear) are also in silver and underline the robust appearance of the ŠKODA KODIAQ SCOUT. The Alcantara®-upholstered seats in the black interior bear the SCOUT logo and come as standard along with the door trim in the same material. The four door sill trims feature the KODIAQ logo. The infotainment screen displays the steering angle, compass and altimeter, as well as oil and coolant temperatures. 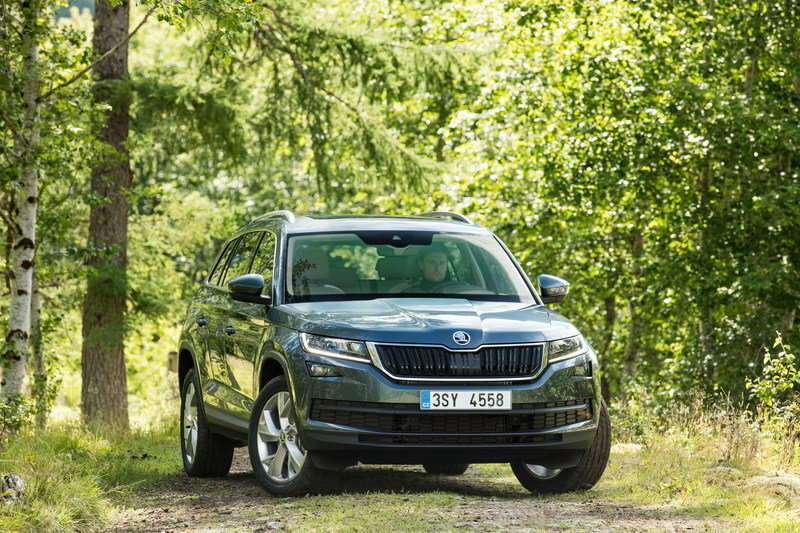 Petrol and diesel engines with outputs ranging from 110 kW (150 hp) to 140 kW (190 hp) are available for the ŠKODA KODIAQ SCOUT and SPORTLINE model versions.